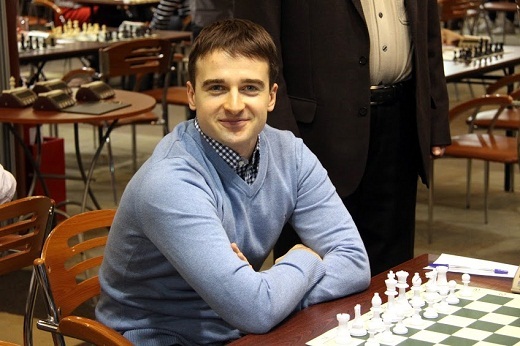 Here is GM Leko’s only victory in Beijing. 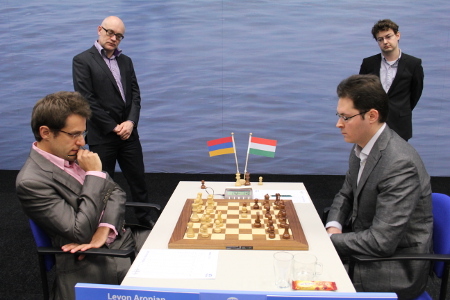 GM Peter Leko and GM Sergey Karjakin analyzing their game of round 7. FIDE Grand Prix Beijing 2013. Interviewer: Anastasiya Karlovych. White is trying to make something out of slightly better piece activity. What do you recommend for white now? TWIC is the work of Mark Crowther. This was a busy week for Hungarian players, who were playing all over the world from Cuba to Thailand. GM Gonda had a fantastic result winning all 5 games. 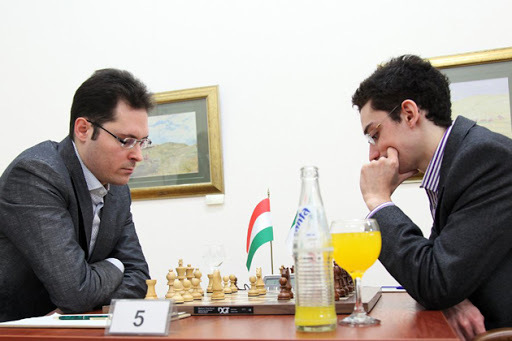 Top Hungarian was GM Horvath,A with 6.5/9. 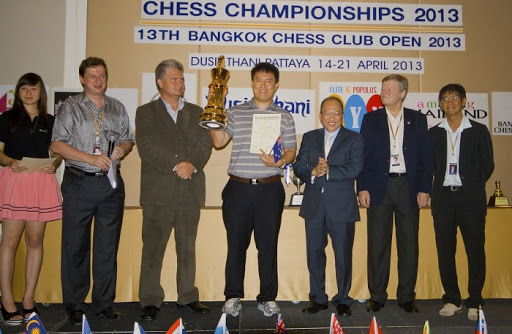 ‘In a multinational field of over 300 players, Australian number one, GM Zhao Zong-Yuan has won the Thailand Open 2013 ahead of big name favorites. GM Zhao had a rating performance just under 2700 overall including a dramatic win over GM Nigel Short in the eighth round. He finished with 7.5 points from nine rounds. Following Zhao Zong-Yuan were six players on seven points. On tiebreaks, IM Wan Yunguo took 2nd place and a GM norm. GM Jan Gustafsson, who admitted that “he’s just on holiday” when asked about the tournament, finishes in 3rd place. Zhao Zong-Yuan took clear first with 7.5/9. 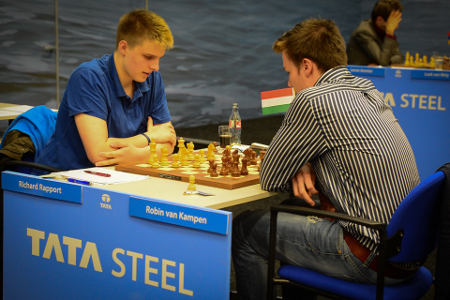 Here is a beautiful game by Peter Leko from Tata Steel Group A played in rd11. The Tata Steel event was beautifully photographed and organized. Van Wely defended aggressively with the Sicilian Dragon but Leko invited a RRB-RRN ending and showed some fabulous technique to grind out the win in model fashion. White has the better structure. How should white continue? Black is preparing a pawn break after playing 47..f6. How should white continue? Here is Leko’s win in the Spanish over Caruana. Leko has 4/8 so far. Black has just blocked the position with 40…g5 and aims to hold the kingside by constructing a dark square defensive wall. How should white continue the attack? TWIC-The Week In Chess is the work of Mark Crowther. There were no Canadians in action this week and still no games from the Panama Open. Rapport, Movsesian and Timman share the lead with 5.5/8. Balogh,C had a great score with 3/4 while other Hungarians were not so sucessful. The talented Juhasz brothers continue to gain valuable experience in international league play. Leko scored 5.5/11 for a solid result. 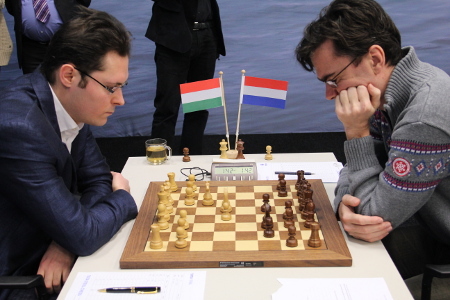 ‘… the Italian(Caruana-right) was never close to a win against Peter Leko(l). Here is Leko’s only win. White played the harmless 9.Bd2 and got nothing in the opening. Now later, black has just recaptured with 22…Nxd5 and an endgame has begun. How do you assess the position? -Unclear, it’s too soon to tell as the Nc6 gives white a chance to make murky play. 26.a3 has just been played. The RRB-RRN ending looks complex but really it is not. Black has the better structure and more useful minor piece. How should black proceed?